In Idle Space: Tycoon game, you unlock ship hangars and add space ships to them. In each hangar, you can deploy up to four space ships and one pilot(or more for each ship). These space ships gather the resources and sell them for idle credits. The pilot at ship hangar makes the whole process automatic. You can upgrade a hangar to increase the Idle credit income through space ships work. As you progress further, the cost of new ship hangars will increase. In addition to that, the cost of hiring a pilot will also increase gradually. On top of that, you can start this space tycoon business in other parts of the world. You will have to pay a one-time fee to unlock that area and then you can deploy more ship hangars, pilots, space ships to earn more money. So that’s the basic concept of Idle Space: Tycoon game. Let’s learn everything in detail in our Idle Space: Tycoon guide and Idle Space: Tycoon tips! Tap the pilot icon at the bottom-right corner of the ship hangar to open the hangar menu. As we mentioned above, you can deploy up to four ships in each hanger. All the ships in each hangar give the same amount of income. However, if you assign the pilot, the amount of income may change depending on the pilot’s ability. In the ship hangar menu, you can check the income from each space ship, time to unload cargo, pilot’s stats and the total income stats from all the ships in that hangar. Most of the pilots provide one perk. But tier 2 pilots come with two perks. These perks include; income perk, idle credits perk, duration perk, extra loot perk, and bonus level perk. Income Perk – Pilots with this perk can increase the idle income of the deployed ship. You can assign or resign a pilot anytime in the ship hanger menu screen. Space Cash is the premium in-game currency in Idle Space: Tycoon game. You can purchase boosters using this currency. You get this currency through the top up with real money. At the bottom-right corner, tap the map option to switch to new areas. In each area, you can start space tycoon business and earn Idle credits. The cost of ship hangars, ships will be way too high as compared to the default area. Your objective is to reach the max level, unlock all the ship hangars. The currency system follows the alphabetic order; (after K, M, B, T) – aa, ab, ac, ad, ae, af, ag, ah…b, ba, bb, bc, bd, bf…bz. So this is the Idle Space: Tycoon guide for the beginners. Let’s have a look at our Idle Space: Tycoon tips & tricks! Idle Space: Tycoon Tips & Tricks! You should assign the pilots wisely. As we mentioned above, all these pilots have one or two abilities. In higher-level(number) hangars, you can assign more than one pilot. If you assign the right pilots, you can increase the idle income. For example; you can assign the pilots(who can increase the idle income) to the top ship(highest earner) to increase the idle income. 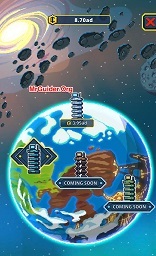 Or before you leave the game, you can assign the pilots(who can increase offline income) to increase offline income. Every now and then, a special chest appears on your screen. You can earn a huge amount of Idle money by watching the video ad. Upgrade the ship hangars to increase the idle income. We would recommend you to focus on the high-level/number ship hangars as the ships of that hangars grant more idle income. You can double your income by activating the ad boosters. All you need to do is tap the boost option at the bottom menu -> tap watch -> that’s it. You can watch more video ads to extend the booster period. When you come back to the game, you have the option to double the offline income. It’s better to accept that offer when you come back to the game after a long period. You can do this in all the areas. So these are some short Idle Space: Tycoon tips for the beginners. If you have more tips, share in the comment below! Previous Post:Era of Legends Best Class – What Is The Best Character Class?